In case you have not figured it out I like Dwarfs. I have a SLAYER below that shows I can paint, click on it to blow it up. 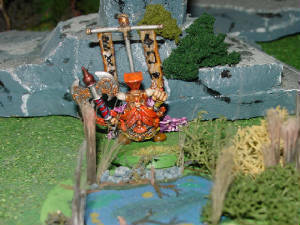 This is a Warhammer Dwarf I won a contest with. The banner is smoked samon skin w/scales. This is just a basic guide to get you started. When you paint you can teach yourself how to do better with each piece you paint. It takes time to get good. The more you paint the better you get. However this can get expensive real quick. What I recomend is this: TIP Start off painting your army or character in steps. 1. Paint the inner most parts first and work your way out of the nooks and crannies. 2. After this is dry and all the major colors are on the model start over. 3. Touch up all the mistakes on the model. 4. Paint all the tiny belts, weapons, etc. all the small stuff. NOW THAT YOU HAVE PRACTICED ON SMALL STUFF 5. Paint the buckles clasps, jewels, eyes, etc. LET IT ALL DRY WELL 6. Highlight the model by using the shade you started with and a little white mixed with it. Lighten it 4 times with white added a little more each time. LET IT DRY 7. Dry brush the model with the lightest shade of each highlight. 8. OPTIONAL - I use watered down black paint on the models to bring out the shadow areas and add a little depth to the model. Water it down a lot and experiment. 9. Spray it with clear to protect it. NOTE: this may make some colors run togeather. 10. Touch up over the clear coat any areas that are too dull ( such as silver on a sword/gun ) and your done. You can skip the clear if you don't mind scratches when you use it in a game. Which brushes do I need ? If you are just starting and don't have any experience with painting, I would recommend that your first set of brushes should be of good but not of the finest quality. Go for good nylon or red sable brushes to get the feeling for the brush. But don't buy too cheap brushes, because they will soon be useless and you will get frustrated and think that the problems you are running into are your fault. But you are simply using a very poor brush. If you have already done some painting, you surely should invest some money in fine Kolinsky brushes or very good Nylons. If you take care of them they last a while, and you will be able to enjoy the brush for many years. Always wash them out, never leave them in the water, and never ever bang them on the bottom of your water cup. The hardest thing to do is make terrain look real. It is hard to make a piece blend and fit in with the other pieces on the table. TIP 1. Try to use the same colors for certain things such as rocks. Use the same color of paint on all rocks you paint and highlight them all the same. 2. Basic grass color on all the models makes them all blend well. 3. When a model stands out too much then tone it down with watered down black/brown. 4. Use the same color flock and bushes to make them all work well togeather. Example: I used grey on all rock formations. I used the same grey on all gravel by houses or hills. I used the same grey on all rocks by trees. I used the same green to paint the bases of each of these models. I used the same flock on the base of each model. I also toned them all down with watered down black. 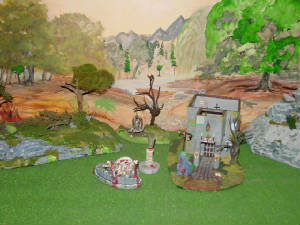 Lastly I used the same color bushes for all the models. Other than these few things the rest of the model can be whatever you like, in whatever color you want. RESULT: They all work good togeather and blend in with the other models I make. I know this picture is not the clearest, but the same high light makes it work no matter if it was made yesterday or last year. I could make you guess, but I won't. The hill was made 3 years ago, the house last year, the alter last year, the rock formation last week, and the man Skeleton was made two weeks ago. The same basic grey was used on all rocks. Some rocks are a little darker here and there, but the same colors were used in all models. Which made them BLEND. I am not talking about the blending technique used on mini characters, but the blend of old models and new ones. This will show the blending a little better. The poor soul in the cage is a Games Workshop model. All of this goes with a Games Workshop, Warhammer army I have. The Chaos undivided. The picture will get larger if you click it. I use cheap LARGE paint bottles from big national companies to do large models of terrain. The small bottles from specialty stores is better quality & cost too much. I save it to do characters with.